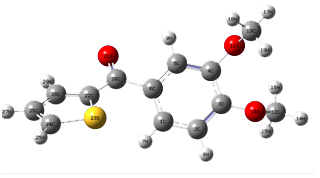 The FTIR, FT-Raman and SERS spectra of (3,4-dimethoxyphenyl)(thiophen-2-yl)methanone were studied. The molecular geometry and the wavenumbers were calculated theoretically using Gaussian09 software and the optimized geometrical parameters are in agreement with that of similar derivatives. The small differences between experimental and calculated vibrational modes are observed. It must be due to the fact theoretical calculations belong to gaseous phase and experimental results belong to solid phase. The calculated first hyperpolarizability is comparable with the reported values and is an attractive object for the future studies on non linear optics. The presence of thiophene and phenyl ring modes in the SERS spectrum indicates that the molecule is oriented in a tilted fashion with respect to the metal surface.